In honour of Charles Darwin’s birthday today, here’s a work by one of the artists from HMS Beagle. 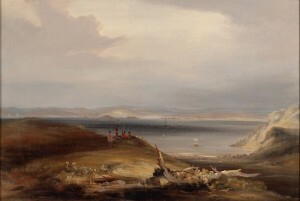 Conrad Martens painted this view of Kororareka, the site of modern Russell, in 1841. It’s based on sketches which he made during on a brief visit there in 1835. Martens had left the Beagle by this point, but the ship passed through New Zealand later that year stopping in the Bay of Islands. Darwin described the English inhabitants, apart from the missionaries at Waimate, as ‘the very refuse of society’, while Maori lacked the ‘charming simplicity which is found in Tahiti’. Martens joined the crew of the Beagle at Montevideo, following the departure in 1832 of another artist with a strong New Zealand connection, Augustus Earle. You can take a virtual browse through Martens’ sketchbooks from the Beagle at the Cambridge University Library.